Here it is, the all-new Kia Sorento. So, what’s new? Plenty. This is no facelift, it’s a new-generation Sorento. Kia says it offers more space, better fuel economy and more equipment than before. It’s an altogether more sophisticated car, Kia claims – hence the more ‘sophisticated’ price tag. The range begins from £28,795, and our KX-3 manual test car costs £35,845. Go for the top-spec KX-4 and you’ll pay over £40,000. We want to see whether the improvements justify the higher price. Those seeking a no-nonsense 4x4 at a bargain price will be disappointed. Can the Kia be a creditable rival for prestige-badged SUVs? What tow car ability does it have? And will today’s Sorento live in the shadow of the much-loved original? This part of the tow car review is where we usually write about how much lighter a new car is, and how that benefits economy and emissions but is no good for its matching ratio. For once, that isn’t the case. The new Kia Sorento is still a beast, with a kerbweight of 1932kg for the six-speed manual model we’ve been driving (the automatic version weighs 1953kg). That gives our test car an 85% match figure of 1642kg. The towing limit is 2500kg – not as high as some big 4x4s, but enough to be academic. Choose the auto and the legal limit is 2000kg. The towball limit is 100kg for both. We matched the Kia to a Bailey Unicorn Cordoba with a mass in running order (MiRO) of 1590kg. First impressions were good. The Kia easily towed up to motorway speeds and felt settled at the legal limit. Only in crosswinds did the driver have to keep the car on course with occasional steering input. 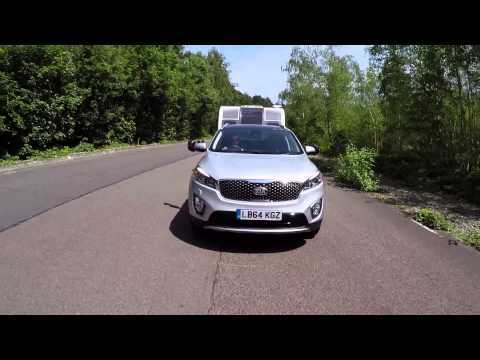 The Sorento’s towing manners were put through a tougher test in the lane-change manoeuvre. Big 4x4s, with their long-travel suspension and high centre of gravity, don’t always get on with this repeated violent change of direction. The Kia coped well, though. Early runs were straightforward although, as we pushed harder and faster, we could feel the tourer tug at the back of the car. However, the Sorento stayed firmly in charge. Good stability is matched by strong performance. The Sorento pulled the Bailey from 30-60mph in a brisk 10.9 seconds. That’s impressive overtaking punch. It’s the flexibility of the engine that really impresses, though. Part of our regular test route involves a stretch of dual-carriageway up a long hill with a 50mph limit. The Kia pulled up this slope in fifth gear. Even when heavy traffic forced our speed down to 40mph, the engine had enough muscle to pull back up to 50mph without needing another downshift. The 325lb ft of torque from just 1750rpm makes this possible. That’s 14lb ft more torque than the previous generation, and 15lb ft more than a Land Rover Discovery Sport SD4. All of that muscle helps the Kia pull away on a steep hill, but even so we found a careful balance of clutch and throttle was needed on a 1-in-6 hill. The conventional handbrake needed a firm pull to keep the car and caravan still on the steep gradient. We’ve no complaints about the brakes in normal towing. They are strong enough and easy to apply smoothly. An emergency stop from 30mph on a dry track needed 10.9m. After putting some serious towing miles on the Kia on the road and on the track, we think the new Kia Sorento marks a real return to form. We’d prefer an electronic parking brake to a manual handbrake, and the very best big 4x4s are a little more secure in a crosswind. These reservations aside, the new Sorento is a very fine tug. If you want excitement, you’ll find more of it behind the wheel of a BMW X3 or a Land Rover Discovery Sport. For most of us most of the time, though, the Kia is a thoroughly competent car. The driver can firm up the steering at the touch of a button, or leave the assistance at the standard level for easy parking. Either way there’s not much in the way of feedback, but the car steers more precisely than the previous generation. The Sorento may not show much enthusiasm for corners, but it actually grips well and resists body roll better than other big 4x4s. A steady pace suits the Kia better. It doesn’t have the finesse and control of a Discovery Sport at high speeds, but the Kia rides more comfortably than the Land Rover around town. It soaks up poor surfaces well, and feels supple but stable on motorways. The big wheels and tyres pick up some road noise. Otherwise the Kia is quiet enough at the legal limit to make a good long-distance car. The engine can sound a bit gruff when cold or if it’s revved hard, but Kia’s efforts to make the new car quieter and more refined have paid off. Once warmed up, the engine sounds distant and subdued. We’re not keen on the manual gearbox, though. Changes are clunky, especially the shift from first to second. Having tried automatic versions of the Sorento, we think the auto suits the character of the car better. Some SUVs are more entertaining, but the Sorento is competent and comfortable. The latest Sorento is longer and wider than its predecessor, and Kia has used this extra size to good effect to make the car more practical. It’s also a much nicer place in which to spend time, thanks to an improved standard of finish and a more attractive design. There’s still a gap between the Kia’s finish and those of its upmarket rivals, but it’s not the gulf it once was. The dashboard is dominated by the 8in touchscreen. It’s quite intuitive to use, and sits high on the dash so there’s no need to take your eyes far from the road. Sensibly, the climate control’s temperature and fan speed are still operated using dials so there’s no need to scroll through on-screen menus to get cold air. In the middle row, there’s enough legroom for one six-footer to travel behind another, although they won’t have as much space to stretch out as in a Land Rover Discovery Sport. Despite being a 4x4, it has no hump in the floor so travelling with three passengers in the middle of the car will be more comfortable than in most rivals. As you’d expect, those in the third row have a lot less space and thick rear pillars restrict the view. However, since the middle seats slide forward on runners it’s possible to give rear-seat passengers extra knee room. What’s more, there are air vents for all three rows so nobody should feel hot and bothered. With seven seats upright, there’s hardly any room for bags. It’s more likely that owners will keep the third row for occasional use, in which case the luggage capacity jumps to a useful 605 litres. Fold the middle row as well (a-quick-and-easy job thanks to levers on either side of the tailgate) and the capacity jumps to 1662 litres. Although it can’t match a Discovery Sport for legroom in the middle row, in every other respect the Sorento is a very spacious and practical car. You’ll pay £35,845 for the Sorento KX-3, although if you haggle that should drop to £34,045, according to research by What Car?. That’s a lot of money, and means the Sorento is starting to rub shoulders with the likes of the BMW X3 and Land Rover Discovery Sport. Mind you, any prestige car that’s comparable on price won’t come close to the Sorento’s generous standard specification. KX-3 trim includes climate control, a sunroof, xenon headlights, sat-nav, an eight-way power-adjustable driver’s seat, heated front and outer middle seats, a reversing camera and a full-size spare wheel. The next spec down, KX-2, misses out on a few luxuries but at £31,995 it’s more affordable. Fuel economy and emissions are reasonable but not class-leading: blame the kerbweight for that. Expect 46.3mpg on the combined cycle and emissions of 161g/km. We achieved a respectable 24.9mpg towing on a mix of A-roads and motorways. There’s no escaping the Kia’s high price and so-so economy, but it is a very well-equipped car. Perhaps it’s time to put a stop to comparing each new Kia Sorento with the first. The original was a true bargain, but today’s car is enormously better in just about every way. The same can be said when considering what tow car capability it has. This generation is much better than the preceding one. The new Sorento’s suspension set-up is well judged, making the Kia a reassuring tug for the driver and a comfortable one for passengers. The updated 2.2-litre engine has bucket loads of pulling power to haul any suitably matched caravan. As a day-to-day drive, the Sorento isn’t as light on its feet as some. However, the same ride comfort that is evident when towing makes it easy to live with in regular driving. The leap forward inside the car is every bit as striking as the improvement in the way the Sorento drives. There’s more space, and all three rows of seats can accommodate adults – although travelling for long distances in seats six and seven would be a chore. The fact that all three rows have dedicated air vents demonstrates that Kia has designed the Sorento with the needs of families in mind. Yes, the Sorento is a lot more expensive than before, but today’s car is packed with safety kit and luxury items. You’ll need to tick a lot of boxes on the order forms of most rivals to get near the same level of equipment. Today’s Kia Sorento may not reach the same height of popularity among caravanners as the first did, but we think it’s the best version yet.